Silly me I meant to highlight these sooner but I think the never-ending cool weather has something to do with it. But we have hope that the new upcoming month will bring us warmer days, so we're showing all of Katy Perry The Geli Sandals available. The deliciously adorable flat sandals feature a PVC upper (which is very on-trend for the summer season), slingback thong silhouette, ankle strap with side buckle closure, a contoured footbed, and a super sweet mostly fruit accent (there's the red lips, and blue evil eye) at the toe post (toe ring style flats are also very in and although these are not "rings", they do give off that style). And they're scented!! 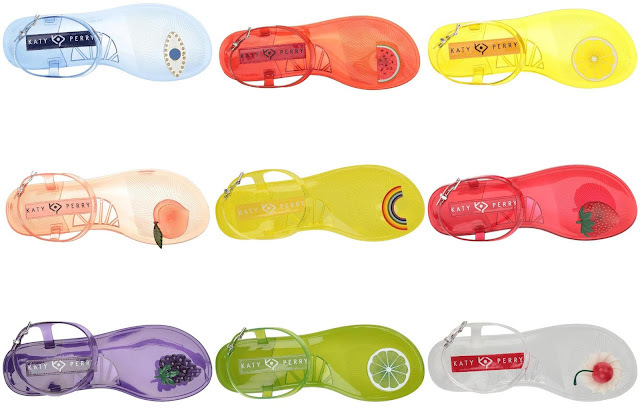 Available in many colors, ten to be exact, the Geli Sandals are a fun way to rock the PVC shoe trend. we must share that they are extremely flat, so if you have an high arch, we recommend getting some arch supports. The Dr. Scholl's DreamWalk Hidden Arch Supports is transparent and would work great with these sandals. Get your favorite for $49.00 regularly at Macy's or Zappos but some colors are available now for less for a limited time on www.macys.com.